This looks like something straight out of a movie set. Now that I know better, when I think of Istanbul, I will think of this place. 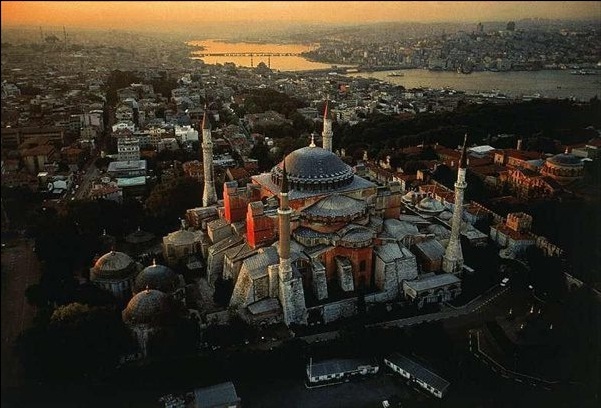 Originally built in the 6th century, the Hagia Sophia, formerly known as a Christian basilica, is now a museum. As a side note, I would museum the heck out of this place. Until recently, well, 1520 to be exact, it served as the largest cathedral in the world. When you think of Byzantine architecture, think of this place. As related to placing the style in time, it may be better referred to as, pre-Neo-Byzantine architecture. It straddles the Bosphorus, one of the world's busiest waterways in northwestern Turkey. If you were wondering, Bosphorus does not make up 1% of your total body weight like phosphorus does. 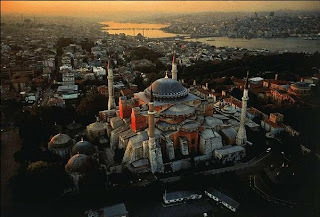 Not to be confused with the Hagia Sophia Church, of Sofia, Bulgaria, construction was completed in only 5 years! And everyone knows Bulgarians are lazy, so their Hagia was rumored to have taken just over 104 years to build. Clearly, this would make the list of the world's greatest buildings. It would fall right in line above the Portland Building.